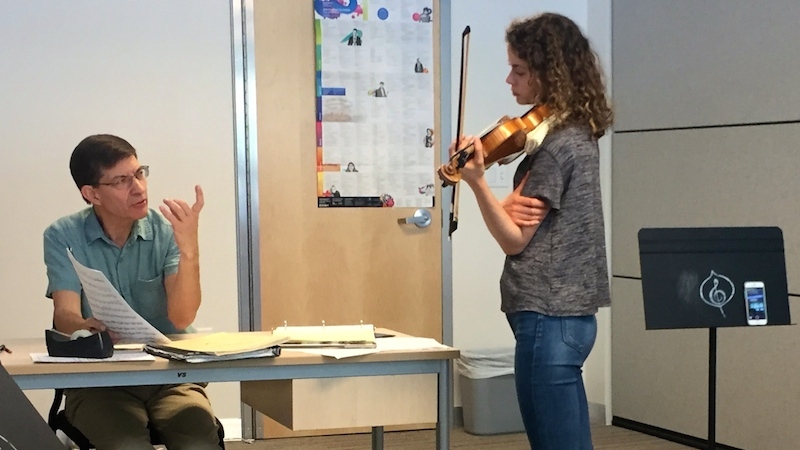 July 26, 2018, 10:16 PM · The Aspen Music Festival and School draws some of the best teachers from around the United States and the world, and while I was there earlier this month I observed lessons with two of the violin teachers: Paul Kantor of Rice University's Shepherd School and Robert Lipsett of The Colburn School. For the 2018 season at Aspen, there are 38 artist-faculty violinists over the course of the summer and 143 violin students, out of 600 students from 40 states and 40 countries and more than 130 artist-faculty overall. 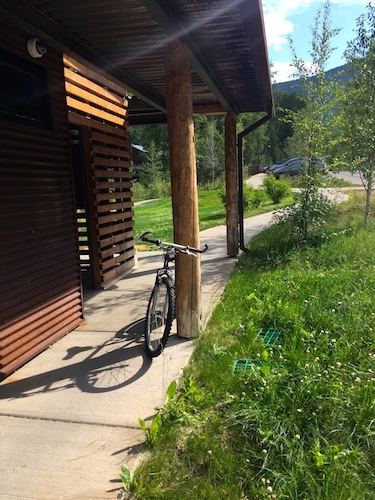 To get to the Aspen School's campus one has to drive just outside the town of Aspen, following a traffic circle onto the two-lane Castle Creek Road, which runs along the back side of Aspen Mountain. This leads to the relatively new Bucksbaum Campus, an $80-million complex of rehearsal halls, teaching studios, practice rooms, and administrative offices built from 2012 to 2016 and nestled next to the creek, in the midst of 38 acres of woodland. 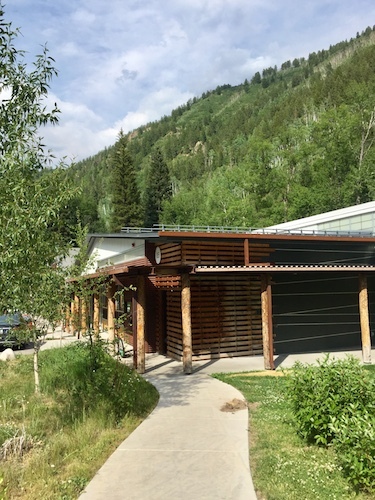 The Lower School building at the Bucksbaum Campus, where many violin lessons take place at the Aspen Music School. On this beautiful afternoon, with a few afternoon clouds hovering and just enough wind to rustle the aspen leaves, I dropped by this idyllic location to observe two wildly successful teachers whose styles could not be more different. I began in the studio of Paul Kantor, who teaches during the academic year as a Professor of Violin at the Shepherd School of Music at Rice University, having previously taught at the Cleveland Institute of Music, University of Michigan, Juilliard, New England Conservatory, and Yale University. From the window of Kantor's studio, I could see those green aspen trees quaking on the mountainside as violinist Jacqueline Audas played the first movement of the Barber Violin Concerto for Kantor. As is often the case when I listen to top-level students, I noticed the many things that were right about this performance: beautiful sound, a sense of both clarity and buoyancy in fast passages. Kantor listened with quiet intensity, writing notes in her music, as she played through the entire movement, with piano accompaniment. Audas recorded her lesson on her phone, which was propped up on a music stand. "I think it sounds spectacular -- beautiful, interesting and sincere," Kantor said. And then they went to work, concentrating on details of timing, the coordination of effects and dynamics, and musical ideas. Paul Kantor discusses the Barber Concerto with violinist Jacqueline Audas. For example, for the entrance of the cadenza, he wanted her to respond to the energy of the piano's downbeat (or orchestra's downbeat) instead of letting the orchestra fade before beginning. Kantor invoked the flutter of a leaf falling down -- "more tumble than fast," he said, adding that "I'd be hard-pressed to say that is a virtuoso passage." This was not the only time they spoke about motion; he also talked about the feeling of going uphill being different from the feeling of going downhill, so that a passage that climbs should also contain that feeling of effort, while a passage that falls contains the feeling of being able to do so with ease. "It's a quasi-tango gesture, it's flavorful," he said. He also offered specific technical insights, such as, "If you're going to do a heroic, beautiful slide," he said, "it is at least as much a right-hand event as a left-hand event." In other words, a glissando, though it is a slide that is done with the left hand, must also be supported by good sound created by the bow, in the right hand. When suggesting a bowing change, Kantor wrote it in, adding "this is totally erasable, see if it works for you." Mozart wrote a slur at the beginning of the 16th-note passage, but everything else is separate. Quite often, violinists add more two-note slurs in that passage, "which creates a sense of symmetry," Kantor said. But if one considers what Mozart wrote, "the separate bows create a sense of running toward the high point," he said. When slurs are added, "that makes it feel like there is a little stop in that running." Technically, it works to just play the slur, then just go up-bow on the next note and keep going with separate bows, doing the whole passage "backwards" until the top (when those added up-bows on the eighths help it all to work out). Kantor's next lesson was with violinist Hava Polinsky, whose parents also attended the lesson, as they were visiting for the weekend. She was working on the third-movement "Andante" from Bach's solo Sonata No. 2 in A minor. With a beautiful sound, Polinsky played the full movement for him, with a sense of relaxed spaciousness. Violin Professor Paul Kantor talks about Bach with violinist Hava Polinsky. When she finished, Kantor talked with her about the marking "Andante," and the hierarchy of Bach's tempo markings. Which indicate the slowest, and which the fastest? Together they put together an order, moving from slow to fast: largo, lento, adagio, andante, andantino, moderato, allegretto and then allegro. "There is no exact tempo we are looking for, but the relative tempos are important," Kantor said. That said, he wanted this movement faster, and he wanted it to feel more like it was in three. "It becomes harder for the melody to make sense if it's too slow." "I believe that the choice of tempo is one of the most important decisions we make, because if we choose poorly, nothing else we do will matter," Kantor said. He asked her if the movement sounded tragic to her, and she said yes. Then he offered her a different perspective. "To my ear this is fairly benign," Kantor said. "It's sweet, it's peaceful." It's an in-between movement: a release from the intensity of the fugue before it, and from the huge first movement. He asked her to consider those ideas, but to come to her own conclusion about it. This movement has two voices: the upper-voice melody, and a lower voice that pulses like a heartbeat. Phrasing, with so much going on, can get a little tricky. "If you are ever unsure, just sing it," Kantor said. "The best and cheapest teacher you'll ever have is your own singing voice." This movement also requires a lot of planning, when it comes to bow distribution. If you are running out of bow in a certain place, ("if the noose is tightening and you are running out of oxygen"), you have three options: 1. Change the bowing (add an extra bow, etc.). 2. Change the bow distribution. 3. Re-consider the tempo. "People become immune to their own discomfort," Kantor said, and sometimes people think that violin-playing is actually supposed to be uncomfortable. Violinists should refuse to be uncomfortable -- if you are uncomfortable, this will come through in your playing. "If you are suffering, don't!" Change whatever is causing the discomfort to something that is workable. Kantor described his philosophy of "AEB": "Always Enough Bow." "It is different from 'more bow,'" he said. "The idea is to always have enough bow for what you are trying to say and what you are trying to do." After spending time in Kantor's classroom, I went across the hall to watch Robert Lipsett teach a lesson. Lipsett teaches at The Colburn School in Los Angeles, where he holds the Jascha Heifetz Distinguished Violin Chair. His open window was letting in the sound of chirping birds and running water as he taught violinist Kako Miura. Lipsett's students tend to be an impressive bunch, and Miura was no exception. When I arrived, they were in the process of doing slow, technical work, going through a (wickedly tricky) Gavinies etude that emphasizes 10ths and other left-hand stretches. Lipsett was intensely present with every note and every detail, offering numerous straight-to-the-point suggestions for immediate implementation. Violin Professor Robert Lipsett listens to violinist Kako Miura. After the etude, Miura played Ysaye's solo Sonata No. 6, and the detail work began immediately, with calm persistence and very specific advice. "You don't let your A and E ring," he observed of the opening chord, "it's like you're not proud of it. Let it ring forever!" She tried it again; he wanted more. "A big circle with your bow, let it ring, keep up the vibrato!" On the second page is a rapid passage of broken octaves; he pointed out that, though the bow breaks up the notes, the lefthand fingers should play it as a straight scale. "There's never a time when fingered octaves don't go down exactly together, or lift exactly together." Still seeking more sound, he put a little more rosin on her bow, noting that "if you hear a little gravel under your ear, it's perfect," and instructing her to play more into the string. "I wish there was more edge in the sound, even when you're playing soft." "When it's loud, work!" Lipsett said. "Is it harder to play that way? Yes. You are farther out on the branch, and it might break and you might fall." You have to start by going to this level in the practice room; "it's something you have to practice in." He noted that it's especially important to get that volume of sound in a work for solo violin, with no accompaniment. "You have to bring it to life," he said, "It's just you!" July 27, 2018 at 02:53 PM · Great article, Laurie! Unless I missed something, it sounds like neither master teacher actually demonstrated during the lessons. Is that correct? July 27, 2018 at 06:53 PM · No, the student was playing the entire time, in all cases. I don't think that means that they never demonstrate (violins were out), nor would I extrapolate on whether it's good or bad to demonstrate, tho! July 27, 2018 at 09:09 PM · Loved reading my this Laurie. I felt like I was in the room with you!